But I am haunted by the human chimpanzees I saw along that hundred miles of horrible country. I don’t believe they are our fault, I believe that there are not only more of them than of old, but that they are happier, better, more comfortably fed and lodged under our rule than they ever were. But to see white chimpanzees is dreadful; if they were black, one would not feel it so much, but their skins, except where tanned by exposure, are as white as ours. This passage is revolting in so many ways that I don’t think it needs any further comment, but it is worth mentioning that Charles Kingsley was, by the standards of his time, regarded as something of a progressive. 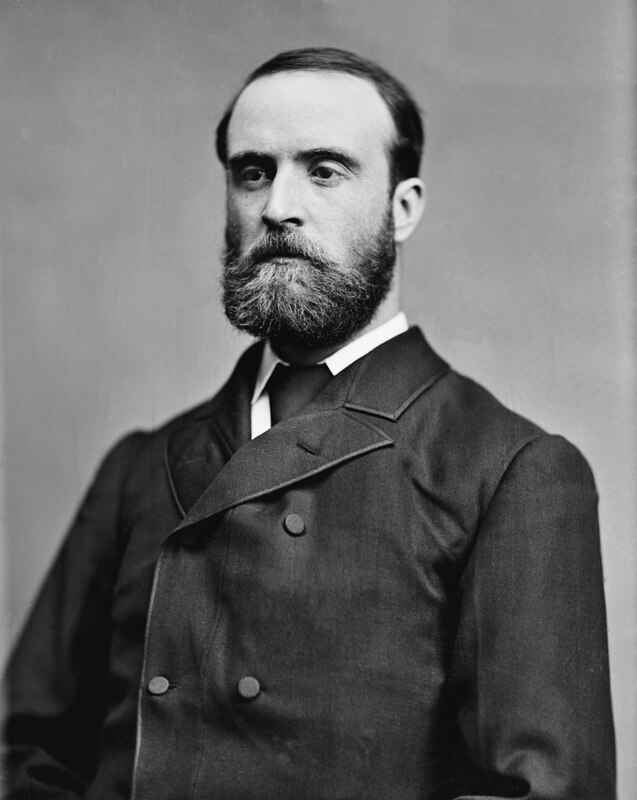 As well as being a Church of England priest, Professor of History and a novelist (I read The Water-Babieswhen I was a child), he was also a social reformer involved in such initiatives as the working men’s college and labour cooperatives. Clearly his concern for the poor and oppressed didn’t extend much beyond his own people. P.S. In the interest of full disclosure, I should also mention that Charles Kingsley did his undergraduate studies at Magdalene College, Cambridge, as did I (thought not at the same time). It’s been a while since I posted a cute physics problem, so try this one for size. 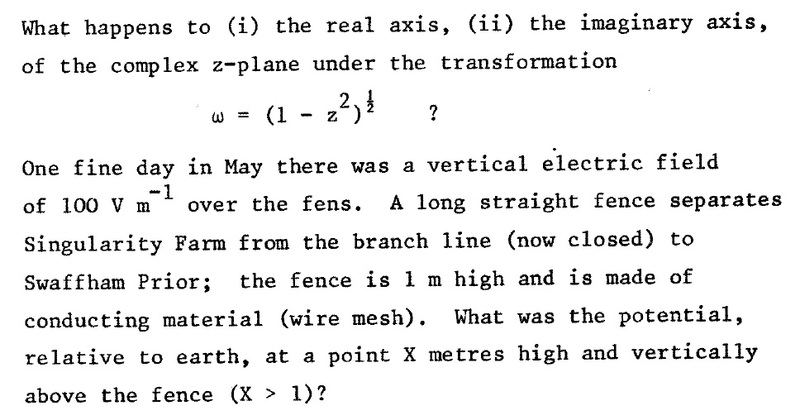 It is taken from a book of examples I was given in 1984 to illustrate a course on Physical Applications of Complex Variables I took during the a 4-week course I took in Long Vacation immediately prior to my third year as an undergraduate at Cambridge. Students intending to specialise in Theoretical Physics in Part II of the Natural Sciences Tripos (as I was) had to do this course, which lasted about 10 days and was followed by a pretty tough test. Those who failed the test had to switch to Experimental Physics, and spend the rest of the summer programme doing laboratory work, while those who passed it carried on with further theoretical courses for the rest of the Long Vacation programme. I managed to get through, to find that what followed wasn’t anywhere near as tough as the first bit. I inferred that Physical Applications of Complex Variables was primarily there in order to separate the wheat from the chaff. It’s always been an issue with Theoretical Physics courses that they attract two sorts of student: one that likes mathematical work and really wants to do theory, and another that hates experimental physics slightly more than he/she hates everything else. This course, and especially the test after it, was intended to minimize the number of the second type getting into Part II Theoretical Physics. Another piece of information that readers might find interesting is that the lecturer for Physical Applications of Complex Variables was a young Mark Birkinshaw, now William P. Coldrick Professor of Cosmology and Astrophysics at the University of Bristol. As it happens, this term I have been teaching a module on Theoretical Physics to second-year undergraduates at the University of Sussex. This covers many of the topics I studied at Cambridge in the second year, including the calculus of variations, relativistic electrodynamics, Green’s functions and, of course, complex functions. In fact I’ve used some of the notes I took as an undergraduate, and have kept all these years, to prepare material for my own lectures. I am pretty adamant therefore that the academic level at which we’re teaching this material now is no lower than it was thirty years ago. Anyway, here’s a typically eccentric problem from the workbook, from a set of problems chosen to illustrate applications of conformal transformations (which I’ve just finished teaching this term). See how you get on with it. The first correct answer submitted through the comments box gets a round of applaud. So here I am again, on campus, on a Saturday, this time to attend some receptions for new students (“Freshers”) who have just arrived at the University of Sussex to start their courses. I always enjoy meeting the new intake at this time of year; we sometimes call them “The Autumn Collection”, although it’s only mid-September and definitely not autumn yet. In fact it’s very warm and sunny and summery on Falmer campus today. The downside of these annual events is that the students look much younger every year, so every one makes me feel a lot older than the one before! Looking through my back catalogue of blog posts I realize that this blog is six years old next week. One of my first blog posts was about memories of my own first day at University and it seems appropriate to repeat some of it here. I notice actually that virtually all Freshers’ weeks I’ve written about over the past six years have been accompanied by fine weather. I find this kind of weather a bit spooky because it always takes me back to the time when I left home to go to University, as thousands of fledgling students are about to do this year in their turn. I did it 32 years ago, getting on a train at Newcastle Central station with my bags of books and clothes. I said goodbye to my parents there. There was never any question of them taking me in the car all the way to Cambridge. It wasn’t practical and I wouldn’t have wanted them to do it anyway. After changing from the Inter City at Peterborough onto a local train, we trundled through the flatness of East Anglia until it reached Cambridge. The weather, at least in my memory, was exactly like today. I don’t remember much about the actual journey, but I must have felt a mixture of fear and excitement. Nobody in my family had ever been to University before, let alone to Cambridge. Come to think of it, nobody from my family has done so since either. I was a bit worried about whether the course I would take in Natural Sciences would turn out to be difficult, but I think my main concern was how I would fit in generally. I didn’t have any posh clothes, a deficiency I thought would mark me as an outsider. I had always been grateful for having to wear a school uniform (which was bought with vouchers from the Council) because it meant that I dressed the same as the other kids at School, most of whom came from much wealthier families. But this turned out not to matter at all. Regardless of their family background, students were generally a mixture of shabby and fashionable, like they are today. Physics students in particular didn’t even bother with the fashionable bit. Although I didn’t have a proper dinner jacket for the Matriculation Dinner, held for all the new undergraduates, nobody said anything about my dark suit which I was told would be acceptable as long as it was a “lounge suit” (whatever that is). Taking a taxi from the station, I finally arrived at Magdalene College. I waited outside, a bundle of nerves, for some time before entering the Porter’s Lodge and starting my life as a student. My name was found and ticked off and a key issued for my room in the Lutyens building. It turned out to be a large room, with a kind of screen that could be pulled across to divide the room into two, although I never actually used this contraption. There was a single bed and a kind of cupboard containing a sink and a mirror in the bit that could be hidden by the screen. The rest of the room contained a sofa, a table, a desk, and various chairs, all of them quite old but solidly made. Outside my room, on the landing, was the gyp room, a kind of small kitchen, where I was to make countless cups of tea over the following months, although I never actually cooked anything there. I struggled in with my bags and sat on the bed. It wasn’t at all like I had imagined. I realized that no amount of imagining would ever really have prepared me for what was going to happen at University. I stared at my luggage. I suddenly felt like I had landed on a strange island where I didn’t know anyone, and couldn’t remember why I had gone there or what I was supposed to be doing. I’ve had that feeling ever since, but after 32 years I think I’m used to it. 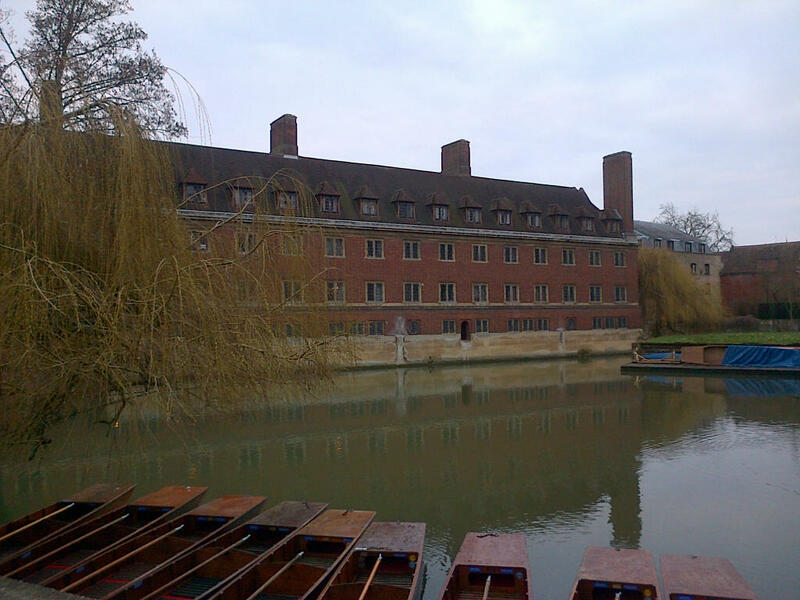 During my short visit to Cambridge on Wednesday I happened to pass through Magdalene College (on my way to a couple of pints in The Pickerel). I couldn’t resist taking a pic of the Lutyens Building, where I lived in the first year (1982/3). My room was second from the far end, on the first floor. I wonder who’s in there now?